In a session where major issues of gun control, school safety and funding, climate change and medical coverage captured the headlines, the General Assembly took time to protect Maryland’s history and sacred burial sites. The effort required 2 bold sponsors, a core group of resolute advocates, 5 House and Senate committees, and hundreds of emails and phone calls to pass the first burial sites legislation since the 1990s. 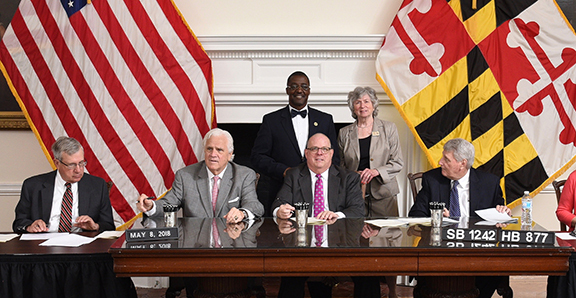 Governor Larry Hogan signed both bills on May 8. We traded a signing pen for “I Brake for Old Graveyards” bumper sticker. While half of the changes proposed by the Coalition and allies did not survive in committees, we are happy to report that descendants and caretakers will gain easier access, owners will be required to consult with the Maryland Historical Trust about conservation treatment, and counties and towns are now authorized to provide a property tax credit related to burial sites. Effective date of this legislation is June 1, 2018. The precise new wording in sections of the Annotated Code of Maryland will be posted on this site as soon as those details are available from Legislative Services at the Maryland General Assembly.